Translink, Northern Ireland's public transport operator, has warned it will need an extra £12m in 2018/19 to keep operating services at current levels. It is funded from a combination of fares and government grants. The company said its government funding has fallen by almost £16m, or 20% since 2013/14. In 2016/17 it showed an operating loss of £10.9m, compared to a loss of £10.5m the year before, and has budgeted for a further loss this year. The company has been able to fund those losses by running down cash reserves, but that position will not be sustainable. A note in the accounts says it has not prepared a new corporate plan as there is "currently no minister and lack of certainty on future resource allocations from the NI Executive." Passenger numbers across Translink's bus and rail services rose by just under 2% over the year to 79.9m. That was driven by increases on NI Railways and the Belfast Metro bus services, with numbers down slightly on Ulsterbus services. The company also continued to make efficiencies, which reduced operating costs by £6m. 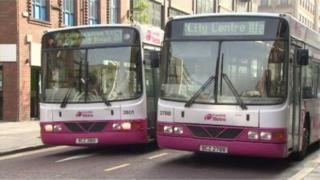 It is due to launch the Belfast Rapid Transit (BRT) service in the autumn of 2018. Translink is also understood to be examining the possibility of introducing electric buses on its Metro network in 2019.